I had the privilege to do voice over for “National Bird,” a new documentary directed by Sonia Kennebeck. The film is getting its world premiere at the prestigious Berlinale 2016, International Film Festival. It took 3 years to go from the idea and research to funding and finding answers, and finally to its world premiere. Tortured by guilt over participating in the killing of faceless people in foreign countries, they decide to speak out publicly, despite the possible consequences. Their stories take dramatic turns, leading one of the protagonists to Afghanistan where she learns about a horrendous incident. But her journey also gives hope for peace and redemption. For more details CLICK to watch a Berlinale panel discussion about the film. I’ve had a long term relationship with the Festival Theatre Ensemble, the company that performs Shakespeare under the stars each summer in two venues…Full Circle Farm and in Los Gatos. For five years, I had the privilege and great experience to act in two Shakespeare titled shows plus an additional classic title with this group. And now after a couple years absence, I returned to experience the season as an audience member. Easily one of Shakepeare’s more recognizable comedies, this was my favorite of the season and definitely the most accessible for newcomers to Shakespeare…All thanks to a very lively cast with great chemistry and some great comedic direction by Rachel Bakker. The show is set in a Napoleonic era, an interesting creative direction. Tragedies are harder to do because they just aren’t as fun as the comedies and most people don’t like to go to shows to get depressed. However, Caesar is one to see due to its historical interest and political intrigue. Again the cast does an excellent job bringing out the ‘grey’ aspects of the characters who are neither good or evil, just trying to do what is best for the Roman Empire, their country. But what makes the show stand out the most was director, Bruce W. De Les Dernier’s visual and audio style. The music is well chosen, and he visually set the play in a Mad Men post WWII era, trading in the togas and wreaths for suits and ties. The Pirates of Port Royal is based on the Restoration comedy, “The Beaux Strategem” written by George Farquhar. The play is normally set in a small rural village and is about two con men, a dysfunctional wealthy family, a crooked innkeeper and his saucy daughter, and a bunch of rogue highway men. Director Bruce W. De Les Dernier adapted the script and changed it to pirates on an island off the coast of Jamaica. The first act is slow with lots of exposition and very little action. This has more to do with the restoration comedy style and not the direction. Act II picks up and delivers the fun pirate action, funny musical bits and an absolutely fantastic ending. There are only a few weeks left to enjoy the outdoor Shakespeare experience…Festival Theatre Ensemble shows are always a great experience! I recorded my first audio book, Secret of the Songshell, for author Brian Tashima. It’s been released and is available on Amazon and Audible. This was quite a departure for me as most of my client work typically requires about an hour or two in the studio, but narrating a 300 + page book with many characters took about 20 sessions over three month period to record. I teamed up with Michael Meyer who did all of the editing and special effects for the Spectraland characters. It was a great challenge and I’m so happy that Brian loves the final outcome. Jonathan did an amazing job narrating the audiobook version of Secret of the Songshell. He really brought the characters to life, and his interpretation of the descriptions and dialogue was spot-on. There were many instances where I couldn’t stop smiling as I listened back to the recordings! I would love to work with him again on future installments of the Spectraland Saga. It’s the first of an original script created exclusively for Geek Club Books by Karen Simpson Gardiner with audio recording and editing by Michael Meyer. The audio recording is available for FREE download to all of Geek Club Books subscribers. Jonathan Murphy begins rehearsals for the hilarious play based upon the children’s book, Go Dog Go, at the Palo Alto Children’s Theatre. Shows begin in late January, so organize your dog pack and let your little pups experience live theater! Big dogs, little dogs, yellow dogs, blue dogs. Dogs at work, dogs at play, dogs in hats, dogs in cars! It’s an all out dog party in this colorful hilarious adaption of P.D. 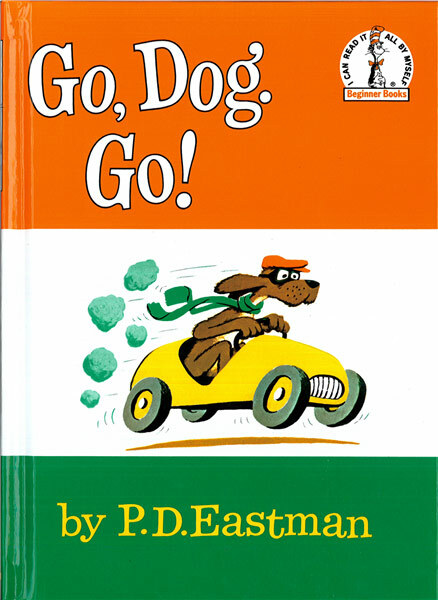 Eastman’s beloved book. Go, Dog, Go! promises to thrill audiences with a chaotic carnival of music and physical comedy that celebrates the many joys and challenges of life and friendship. Come unleash your inner dog. Tickets for all Children’s Theatre productions may be purchased either over the phone or in person at the Children’s Theatre Box Office. Here in the San Francisco Bay Area, Great America’s Halloween Haunt opens tonight! Actor Stanley Bernhard performs as the Overlord to Jonathan’s voiceover summoning all evil spirits to scare all those who dare to enter! Catch the lost tourist, Overlord and the rest of the ghoulish gang Friday, Saturday and Sunday nights at Great America through October 30. Find more at cagreatamerica.com. I’m the Bull in Unbelievable! 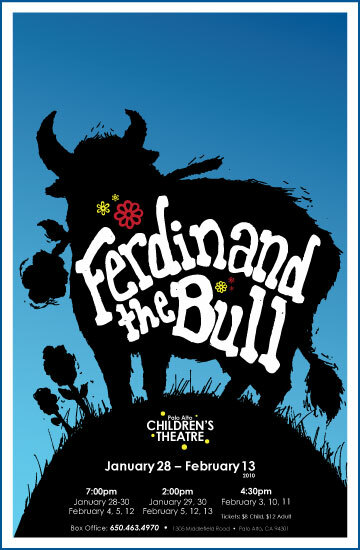 I’ve been performing “Ferdinand the Bull” for The Palo Alto Children’s Theatre. I am Ferdinand…the flower-loving, tango-dancing, peace-making bull! Here in Belle Époque London, an idle young man of independent means invents an imaginary brother, named Ernest, in order to have an excuse to visit the city from the country. When two attractive young women soon fall in love with different men that they each erroneously believe to be the imaginary brother Ernest, the story suddenly becomes very complicated. In Wilde’s satire on the foibles of romance, men and women fall in love quickly. Their imaginations construct for them whatever missing gaps they need filled in to make the romance work. 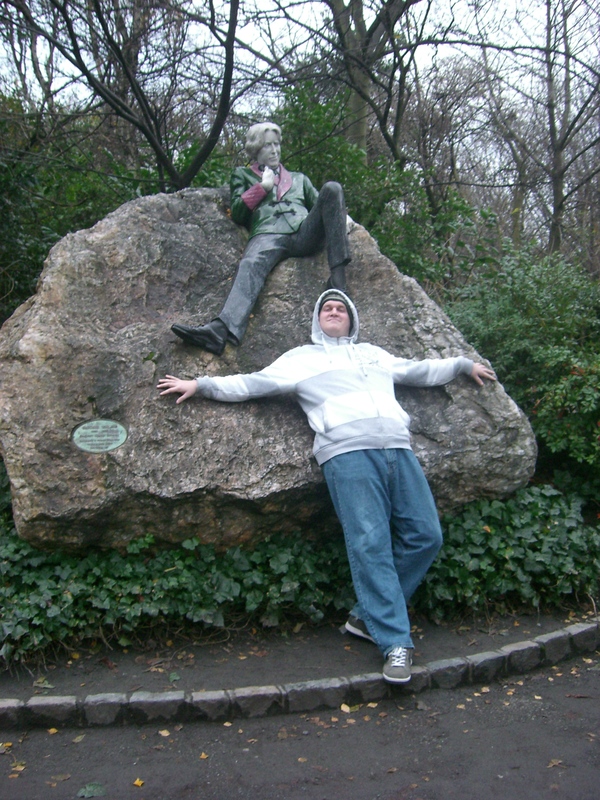 That speed and self-absorption, says Wilde, are the keys to romantic love. “Earnest” contains many story reversals. The socially proper man with the invented brother, for example, turns out to have begun life as an orphan in a handbag found in the cloakroom at Victoria Station. This interferes with his ability to marry into good society. Pedigree is important to this affluent class of society where lazy people don’t work and spend time hanging out, and in which smoking is considered an occupation. “The Importance of Being Earnest” is a witty parable on how we build our social lives on a fabric of not just illusion, but of little white lies. Out of the lies’ ensuing conflicts comes comedy. In director Rachel Bakker’s enjoyable production all the actors offer thoughtful performances, including plenty of double takes, silly walks and screwed- up faces. James Tate is amusing as Jack Worthing (or “Earnest” Worthing, depending on whether he’s in town or country), chafing under the grilling over his pedigree by supercilious potential mother-in-law Lady Bracknell (an entertaining Leslie Newport). 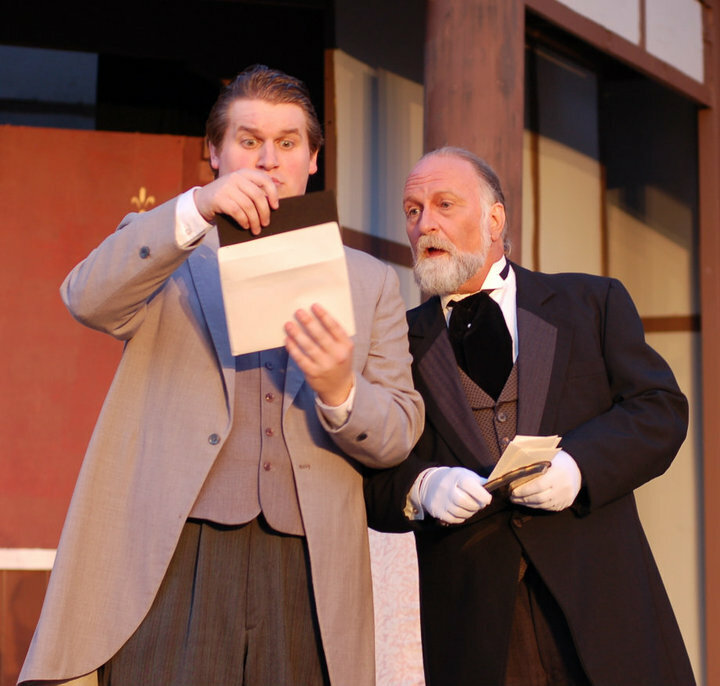 Jonathan Murphy offers a strong foil as Jack’s buddy Algernon, as the two guys debate love, romance, paradoxical social propriety, relatives, idleness and fun. As a pair of young woman on the make, Cindy Powell (as Cecily) and Sara Trupski (as Gwendolen) also acquit themselves well. Here is the moral of this story: that we are all in a light-footed emotional dance with reality. The lucky ones are those spirits fortunate enough to have a good time doing it. Thanks John! 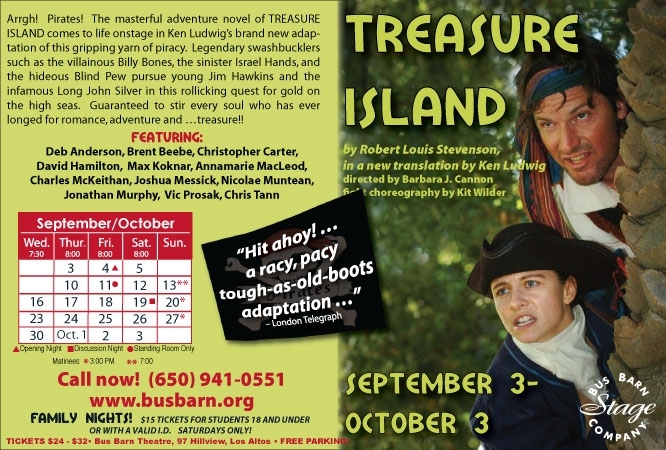 Come and see the show…and Taming of the Shrew…and Treasure Island too! I guess my trip to Dublin brought me some good Irish luck! I was just cast in the Festival Theatre Ensemble’s 2010 season and I will be playing Algernon in the Importance of Being Earnest, Lucentio in The Taming of the Shrew, and Dr. Livesey in Bruce de les Dernier’s adaptation of Treasure Island. The season will kick off in June in Menlo Park and will move to Los Gatos in July and August. Details forthcoming. Click on the e-card and it will link to more detailed information.